After I wrote The Legend of Elijah Craig, I realized we ironically didn’t have an Elijah Craig bourbon review! Lets correct that, shall we? 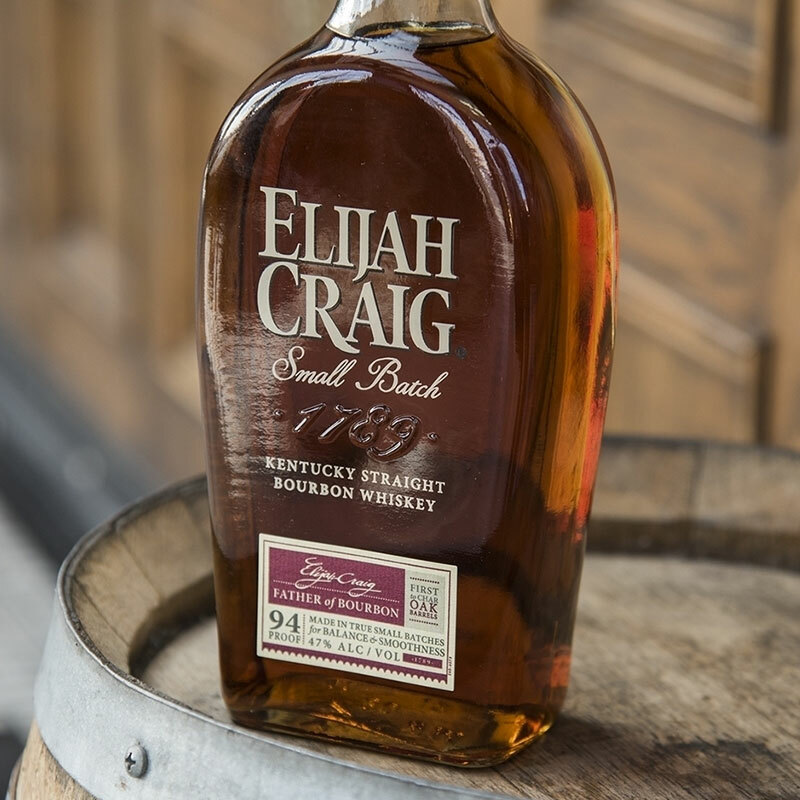 Elijah Craig Distillery operates under Heaven Hill – a real, American operation. Unlike many larger operations, Heaven Hill has remained American owned and operated since it started doing business back in 1935. It used to be called “Old Heaven hill Springs” distillery, but as things go in the bourbon industry the names change frequently. What hasn’t changed is the very small fraternity that has been in control of the brand since the beginning: All of the Master Distillers at Heaven Hill have been members of the Beam family. Anyone else find it funny that the Beams run Heaven Hill and not Jim Beam? And that there is a statue of Booker Noe in front of Wild Turkey, while Fred Noe is in charge of Jim Beam? Well, turns out Fred Noe is Jim Beam’s great grandson. So in essence, Wild Turkey, Jim Beam, and Heaven Hill all owe their existence to one man: Johannes “Reginald” Beam (1770–1834). More on him later. There is one story from Heaven Hill bourbon lore that I love hearing, and that is the story of the ‘river of fire’. Those of us enjoying Elijah Craig 12 today dont realize how close we came to losing it forever. On November 7, 1996 plant DSP-KY-31 at Heaven Hill erupted into flames. Flames are the last thing you want near high proof alcohol. It didn’t take long for nearby warehouses to catch aflame as well. When these barrels exploded, whiskey literally flowed out of the rick houses and into nearby Town creek, literally turning it into a river of fire. Witnesses reported seeing whiskey barrels explode and rocket across the sky like shooting stars. It was a tragedy that nearly spelled doom for Heaven Hill. Instead of cheering at the misfortune of one of their rivals, Brown-Forman and Jim Beam stepped in to help. Thanks to them, we have Elijah Craig, Heaven Hill, Larceny, Parkers Heritage Collection, and so many other brands that we all love. Before you even crack open the bottle, you know you have something special in your hands. The color deep and rich in a way that only a well aged bourbon can be. It damned near glows reddish brown. To truly appreciate the aroma, you will need to give this bourbon a few minutes to open up. While EC12 is only 94 proof, it noses like a much bigger boy than it is. You want to do your nosing in a nice rocks glass, a neat glass, or anything but a glencairn as the nose can be overwhelming. Even in a wide-mouth glass, the nose doesn’t back down. While there is a very light whisp of smoke, astringent is the first thing that I smell. You know that blue stuff in the barber jar? Yea. That. Once I let EC open up, vanilla becomes detectable. The way the sweetness and astringent mingle reminds me of amaretto in a good way. A few more minutes and the character of the nose becomes orange and honey-glazed ham, baby. If you let the glass sit after finishing your pour, it smells so good you could turn it into a glade candle. Sweet, sweet honey and vanilla with no traces of the potency that a fresh pour hits you with. The first sip is true to nose – a nice tingle (Elijah Craig’s mash bill is 75% corn, 12% rye, and 13% barley) a good burn, and a heavy, buttery texture. The alcohol is unavoidable if you are drinking it neat, but right on its heels you get rewarded with citrus, rum butter, and even apricots! The finish is bliss. If you dont smile while you enjoy the fruit finish and the syrup that coats your tongue, just go drink vodka. Elijah Craig 12 Year Old Bourbon is not for every bourbon drinker. Its a big boy with a strong character and a complex and mature structure. Personally, it has everything that I look for in a bourbon, but I understand how new bourbon drinkers might not be ready for EC12. I reluctantly give Elijah Craig 12 Year Old a B. Check out how we grade bourbons. You can also click the stars below to rate this bourbon yourself! P.S. If you love Elijah Craig 12 Year Old bourbon as much as I do, make sure you are showing it some respect by drinking it out of this here worthy glass! I cannot disagree more. This is one of the few bourbons for the age and price range that can deliver similar breadth of flavors to Pappy., even if Pappy does crank them up by a power of ten. EC 12 certainly is superior to Woodford Reserve and other bourbons you otherwise rated with an A.
I was just replying to a tweet with this same comment! I might have to unfollow. This review even reads like EC12 is better, but the grades tell a different story. I can definitely appreciate the comment. When we grade bourbons we try to do so from the perspective of a new bourbon drinker. That adds weight to our grading system. Our position is to encourage new drinkers to try something they are sure to love, versus catering to those of us with more experienced palates. I consider Stagg an A+. Would a new bourbon drinker? Probably not. Hope that adds clarity. EC small batch is no longer a 12 yr bourbon. How does the new stuff compare? To be honest, I have kept a nice 12 year stash (yes, I am guilty of hording. Dont judge me!) But the new stuff has been on the radar for awhile. Getting around to doing another side-by-side soon! If someone were to ask me, “What is the most bourbon-y of bourbons?”, this is what I’d recommend. It’s not the best bourbon, but it packs so many bourbony qualities into a pour. Like you, I hoarded several bottles when they went NAS so I’ve yet to try the new version. I hope they were able to maintain the same flavor profile. I think EC 12 was one of the great values in bourbon and I sorely miss it!! Fortunately, I found a liquor store that had a few bottles left and I bought them all. I would definitely grade this one an “A-“. For the price (I paid $34) it was exceptional value. I do not think the current EC can hold a candle to the old 12. It is a shame they stopped selling the 12. Cheers! I cant agree with you more! Its like when your mom tried to swap out the name brand cereal with the generic stuff. Yes. IT DOES TASTE DIFFERENT! And if not for taste, then why do we drink? Maybe they are trying to pull the old discontinue for a few years then bring it back at a higher price later trick.